In Domestic Flora, the subject’s upper hand is shown curving inward; this gesture, intentionally wrought by the painter rather than spontaneous, is an expressive device whose function is static, contemplative. It is as if we were being told that the entire work is an object of contemplation; even so, it is the face which compels us to linger still more, that demands our closer scrutiny... Flora’s lower hand, her right, forms the terminus of her outstretched arm, before a table with a vase of flowers. At an oblique angle and unsupported, this half-open hand suggests a certain instability, as if about to spring into movement. This is another way of telling us that all manner of domestic tasks fall within the sweep of this active arm. The two hands, while having quite different functions, form an arrangement diagonal to the picture itself. The contrast between the “roughness” of the background, with its plainly visible brushstrokes, and the smoothness of feminine skin, is an expressive device which not only highlights the corporality of the human figure, the real presence of which is depicted here, but creates an image of spiritual refinement and delicacy. 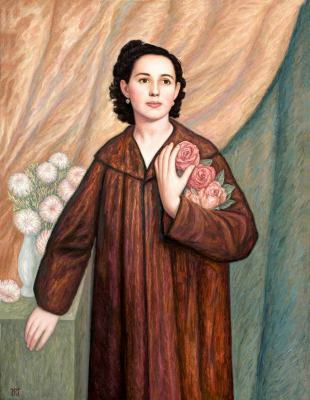 Here the flowers that Flora holds closely to her upper body, encircled by her left arm, are a meaningful image of the charm that she herself radiates, of her own personality. Meanwhile, those that we see behind Flora’s right arm are more expressive of the harmony and beauty that characterise her interaction with her surroundings.